For the short pastry, knead flour, sugar, ground almonds, salt, pink pomelo zest, egg, and cold butter until a crumbly dough is formed. Transfer to a work surface and knead into a ball, then form into a disc. Wrap in plastic and rest for at least 2 hours in the fridge. Preheat the oven to 200°C/390°F. Roll out the dough on a floured work surface and cut out circles to fit the tart pans. Fit the circles into the greased tart pans, pressing the dough against the sides and cutting away any excess dough. Prick the bottom of each tartlet all over with a fork. Lay out a baking paper circle in each tartlet, pour in pie weights, and blind bake the tartlets for approx. 10 min. Remove the pie weights and bake for another 5 min., or until the edges are golden brown. Allow to cool completely on a wire rack. Blend the pomelo flesh into a purée with an immersion blender. Add pomelo mixture to a bowl set over a simmering pot of water. Add sugar, butter, and eggs and whisk constantly until the mass thickens or reaches 80°C/175°F, approx. 15 min. Set aside to cool. Fill the cool pomelo mixture into the cooled tartlet crusts. Chill in the fridge for approx. 1 hr. For the meringue, heat the honey, water, and vanilla extract in a small pot. Beat the egg whites in a large bowl with a sprinkle of salt and sugar until stiff, then add the warm honey mixture and whip until stiff and glossy. Transfer to a piping bag. 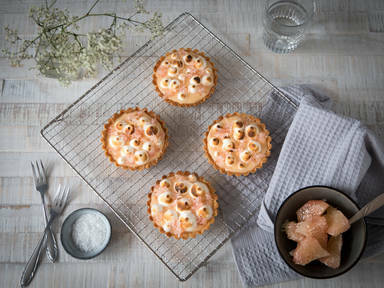 Pipe the meringue onto the cooled tartlets. Torch the meringue, if desired. Garnish with flaky sea salt and more pink pomelo segments. Enjoy!